Attendees add to their knowledge during the new quick-burst learning Guru Bars. The ATS Exhibit Hall is home to the latest technology developments, and those advances go beyond hardware to include software and research related to improving outcomes. 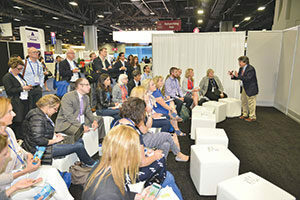 ATS 2017 attendees are taking advantage of learning about technology developments both at exhibit booths and in presentation arenas, such as the Guru Bars, Industry Theaters, and NIH Theater. One such opportunity to gain knowledge in the Exhibit Hall is the Guru Bars. Vinod Aiyappan, MD, from Adelaide, Australia, attended a session on lung cancer screening. Three-dimensional imaging can be used to help predict the course of a tumor, he says. “I am interested in learning about technology for navigational bronchoscopy for cancer screening. We cannot see displays like this in Australia,” he says of the Guru Bar presentation by OncoCyte Corporation, Booth 1849, on new screening technology. OncoCyte is working to develop novel, non-invasive blood and urine diagnostic tests for the early detection of cancer, as well as diagnostic tests for lung, bladder, and breast cancer. The tests use proprietary sets of genetic and protein biomarkers that are differentially expressed in specific types of cancer. OncoCyte focuses on diagnostics with high negative predictive value to help reduce the cost of care through the avoidance of costly diagnostic procedures. Monaghan Medical Corporation, Booth 2020, is presenting abstracts and other evidence supporting improved patient outcomes through the use of aerosol drug delivery and lung health devices such as improved chambers, mouthpieces, or masks. That includes two poster presentations that link the use of chambers with improved asthma control and patient outcomes. Monaghan also has an in vitro presentation of aerosol delivery characteristics of a mouthpiece or mask for adults who may have inhaler coordination challenges. Hans Rudolph, Inc., Booth 1230, has a new disposable interface concept that allows the use of the same mask on a patient from an emergency scene until the patient is in his or her hospital room. The mask can be used for non-invasive ventilation procedures during transportation; in the emergency room; during acute care, surgery, or sub-acute care; and in the hospital room. ResMed, Booth 436, has smaller positive airway pressure devices and masks, as well as cutting-edge software applications. Speakers are presenting clinical evidence for ASV and COPD therapies in presentations, as well as hands-on product demonstrations of new technology and therapy devices.